People: Get as many people from the CU as possible. Go around the college in pairs. Invite students to take part in the questionnaire in a friendly way. Explain you’re from the CU and are wanting to find out what people in the college think about … (insert title here). Lead: It’s best for you to take students through the questions and write down their answers. Discuss some of people’s answers: that’s interesting, what makes you think that? If people would rather not discuss, that’s fine, continue through the questions. Don’t mock the answers if you think they are odd. Treat all people with gentleness and respect. If you’re not sure what someone means, ask them to explain a bit more. Pray: Give it all to God. Ask Him to use you all, make it happen and bring people along! It’s all about Him and for Him, so praying is a great start. 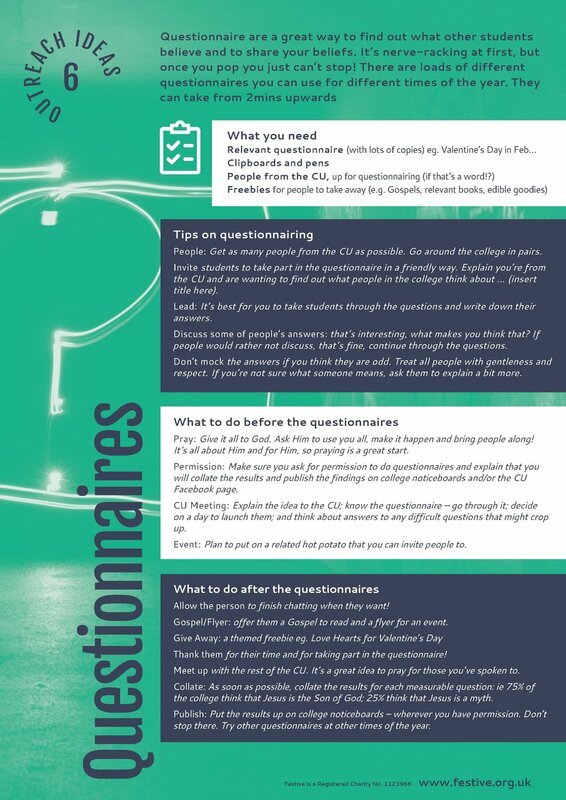 Permission: Make sure you ask for permission to do questionnaires and explain that you will collate the results and publish the findings on college noticeboards and/or the CU Facebook page. CU Meeting: Explain the idea to the CU; know the questionnaire – go through it; decide on a day to launch them; and think about answers to any difficult questions that might crop up. Event: Plan to put on a related hot potato that you can invite people to. Allow the person to finish chatting when they want! Gospel/Flyer: offer them a Gospel to read and a flyer for an event. Thank them for their time and for taking part in the questionnaire! Meet up with the rest of the CU. It’s a great idea to pray for those you’ve spoken to. Collate: As soon as possible, collate the results for each measurable question: ie 75% of the college think that Jesus is the Son of God; 25% think that Jesus is a myth. Publish: Put the results up on college noticeboards – wherever you have permission. Don’t stop there. Try other questionnaires at other times of the year.